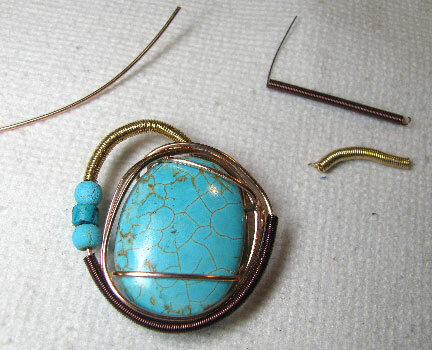 One afternoon, I sat down with 2' of 18 gauge copper wire, some previously wrapped coils (24 gauge craft wire), and a large turquoise-colored stone. I don't think it's real turquoise (look at the fake-looking matrix), although that's what it was sold to me as at a show. I'm fairly sure it's just dyed howlite or something similar, but it's still pretty. You can trust Beadaholique's stones to be what they say they are. I started with the wire held diagonally across the back of the stone, and then wrapped each end across the front and across the back again. At that point, I began to form the wire around the circumference of the stone, loosely like a bird's nest. 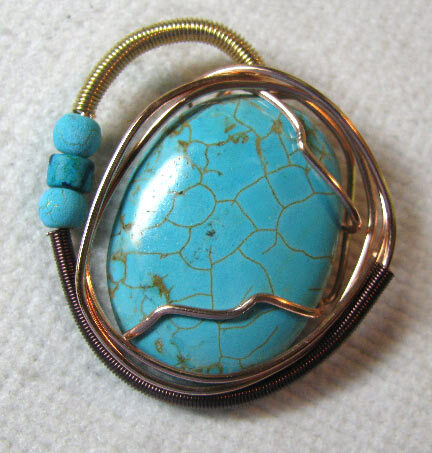 On the final wrap around the outside, I added the two coils and a couple of chalk turquoise beads. The ends of the wires are anchored onto wires that cross the back of the stone. The horizontal wires on both the front and in the back were tweaked to keep the wrapping secure. My first thought was that this would be a pendant, but now I'm thinking that maybe it will end up being an element in a larger piece, maybe even a bead embroidered one. Who know? Stay tuned!